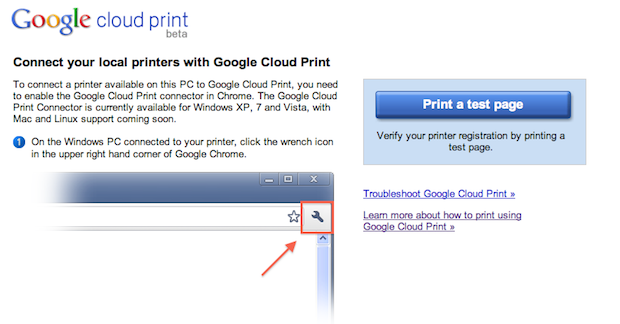 Back in April, we wrote about a very cool new feature that Google was working on alongside Chrome OS: Cloud Print. Essentially, it’s a service that takes all of the printer drivers you normally need on a computer and puts them in the cloud (on Google’s servers). This way, you can easily print from a machine regardless of the OS. This means you can print from Chrome OS or from any mobile device. And it appears that it’s now just about ready to roll out. 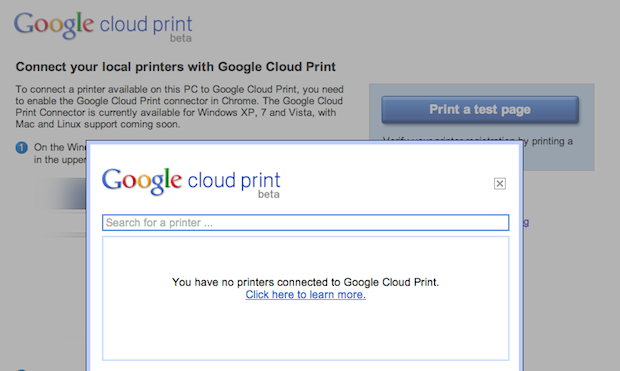 As you can see here, there’s already a live landing page for Google Cloud Print. From this page, you can print a test page. This shouldn’t be too surprising given that Google is believed to be unveiling a beta version of Chrome OS at an event in San Francisco later today. But one caveat on the beta is that is says you currently need Windows 7, Vista, or XP to use it. It says that Mac and Linux support is coming soon. This doesn’t seem to have much to do with the user end, but rather the printer end. Currently, you need to have a Windows PC connected to a printer to set it up, it seems. Earlier reports said the feature would require Chrome 9 as well (the dev build of Chrome is currently version 9). And it is slated to be a Chrome 9 feature. But as of five days ago, the feature was being passed through the Chrome marketing team for final approval. One possibility seems to be that Chrome OS will launch with stable, beta, and dev channels just like Chrome, and this Cloud Print feature could be enabled on the dev (and possibly beta) channels as that will likely run Chrome 9 instead of Chrome 8 (yes, inside of Chrome OS itself). WebSonic.nl has some screenshots of the feature actually working on a Windows machine. The ones in this post are from my Mac machine.